Solar-wind Chime by Helen White is the result of a 3 month Communicating Science residency at Pervasive Media Studio supported by IOP Publishing. Listeners can hear and see suspended aluminium tubes resonate with the fluctuations of the solar wind. Realtime data on solar wind speed gathered by the ACE spacecraft in the gravitational midpoint of the Earth and Sun is converted into music by the Solar-wind Chime. As the sun’s activity ebb’s and rises over the course of hours, days and months the chimes ambiently reflect this. 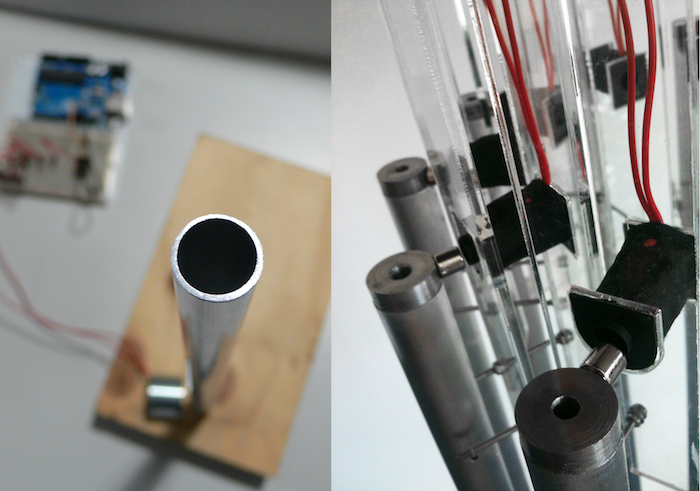 Solar-wind Chime turns solar wind data into sound. The sound is generated by electromagnets oscillating a series of tuned aluminium tubes at their resonant frequencies. 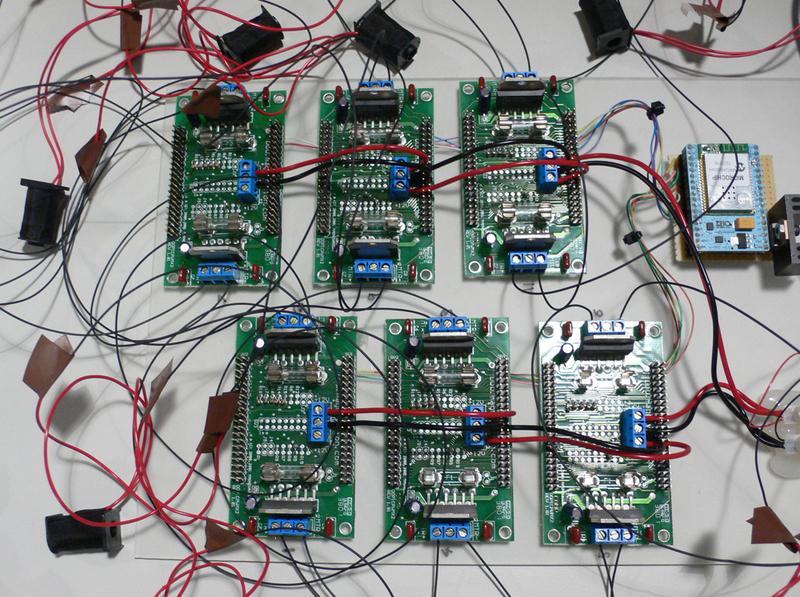 The 12 electromagnets are powered by driver boards controlled by an x-OSC. The x-OSC allows us to generate PWM outputs for the electromagnets based on OSC commands sent over wifi. An application written in Processing running on a computer sends OSC instructions to the Solar-wind Chime, telling it which chimes to oscillate at which frequencies. This application fetches the current solar wind speed data from an FTP site and maps the speed value changes into notes for the chimes. Solar wind speed is measured by the Solar Wind Electron, Proton and Alpha Monitor (SWEPAM) instrument aboard Advanced Composition Explorer (ACE) spacecraft currently observing the Sun. The data is sent back to groundstations and published by NOAA Space Weather Prediction Centre in a text file on an FTP site with only a few minutes delay. The first step of the project was to familiarise ourselves with the terminology and available space weather data. NOAA have a helpful glossary of terms to help us understand what a CME is or the difference between an aa index and a Kp index. Finding data involves digging around FTP servers and websites designed in 1997. There is no single directory of space weather data. There are no standardised data formats and there are no APIs. The data is scattered across many different locations, organisations and formats. The sector’s expertise & priority is in building complex scientific instruments and analysing the resulting data for scientific research rather than web design. 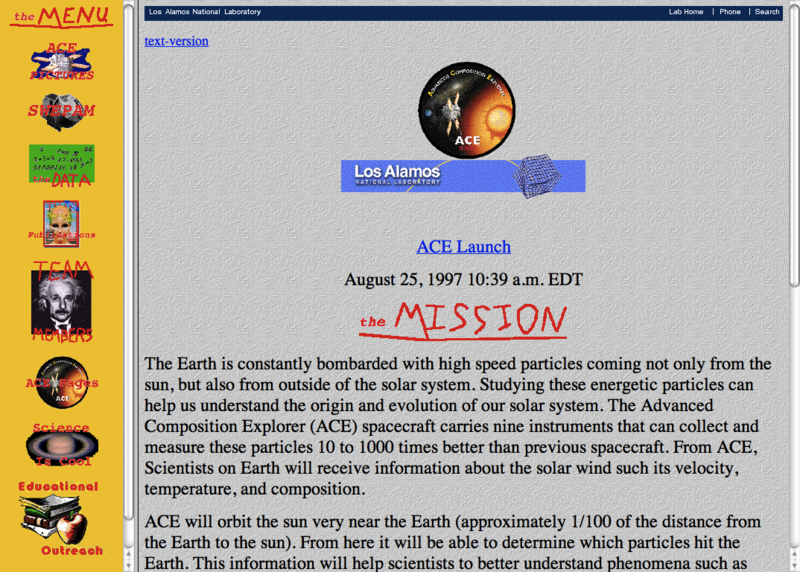 The ACE spacecraft we used data from was launched in 1997 and will (hopefully) operate until 2024. The spacecraft is operated by NASA but the data we use is measured by the SWEPAM instrument aboard which is operated by Los Alamos. The realtime data is published by NOAA but the historical data is published by Los Alamos, both in different formats. Realtime data updates arrive from ACE with few minutes latency. A few times an hour the data returned is unavailable or corrupted but it usually updates once a minute. Not bad for a 16 year old spacecraft 1.5 million km from Earth that I get to use for free. We looked at a number of other data sources. These included Sun observing satellites such as SOHO, SDO, Stereo & ACE; Earth orbiting satellites including POES, GOES, Suomi & IMAGE and ground based measurements such as the British Geological Survey’s magnetic indices. For the Solar-wind Chime we needed realtime data. This rules out a number of data sources. For example some magnetometer data is updated with a few days delay because the data is logged to a floppy disk in a field which must be retrieved manually. Once we had data we could experiment with different visualisations. Our early experiments included a single glowing green LED. When solar wind speed increased the LED would glow brighter and fade if speed decreased. It was left running in front of an audience as Helen gave a talk about her work but proved too subtle at conveying the information. Another experiment used a ribbon of 30 lights of varying brightness showing the last 30 minutes of wind speed history. Visualising the data ambiently with light proved difficult. Either the effect was too subtle to convey information or was too disruptive to the surrounding environment. Helen decided to pursue using electromagnets as a way of visualising space weather data. It seemed a fitting material as space weather occurs due to the Sun’s magnetic field and its interaction with the Earth’s magnetic field. To oscillate a chime with an electromagnet we needed to control the magnet with an analog signal instead of simply switching it on and off. As a first version we used pulse width modulation on an arduino. This let us test the concept and find the correct frequency for each chime. Arduino PWM limited us to only controlling one independent chime per arduino. To control all 12 we needed a better signal generator. We used the AD9850 signal generator for this. The AD9850 generates a constant sine wave at whichever frequency it is instructed to. We could use one of these per chime to generate the music we wanted. At this point we fortunately met Seb Madgwick of x-io, who have created the x-OSC board. The x-OSC board has 16 independent PWM outputs and can be controlled by sending the desired frequencies over wifi as OSC commands. This would be a lot simpler than using an array of AD9850s. Seb also built handy driver boards for controlling the electromagnets from the OSC. You can find more about Solar-wind Chime and see the thought process behind it in the journal on iShed. Solar-wind Chime images in this post provided by Helen White.